The Challenger Services CP4CH pipelayer attach-ment is fabricated specifically for the Cat® Challenger 65, 75, 85 and 95 Tractor. The Caterpillar Challenger Series tractors have rubber track belts ranging in sizes from 25” to 30” wide. This provides more traction and stability and unlike steel tracks, rubber tracks can travel on paved roads. 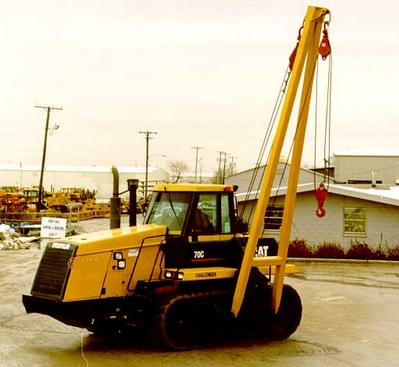 Continuous power to both track belts is provided through differential steering. This means that the Challenger tractor with a CP4CH pipelayer attachment is extremely maneuverable even in a turn. Economically speaking, rubber belts outlast tires.